Form DBO-EL1726 is a California Department of Business Oversight form also known as the "Notice Of Officers, Directors, Trustees, Employees Or Other Persons Directly Or Indirectly Compensated By Escrow Agents". The latest edition of the form was released in May 1, 2017 and is available for digital filing. 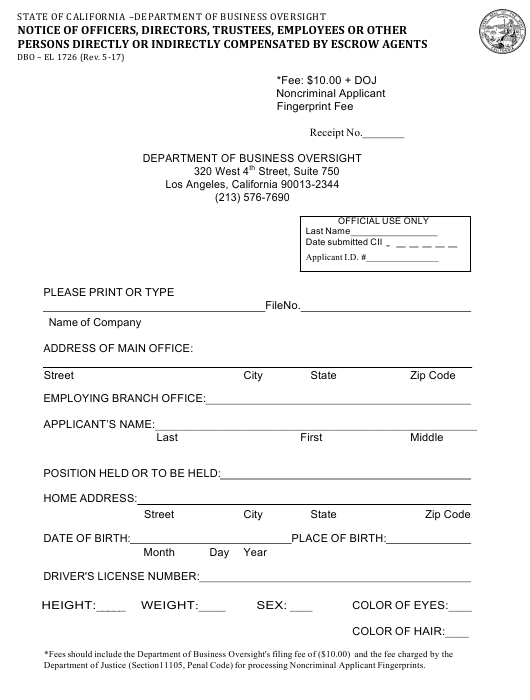 Download a PDF version of the Form DBO-EL1726 down below or find it on California Department of Business Oversight Forms website. Department of Justice (Section11105, Penal Code) for processing Noncriminal Applicant Fingerprints. the individual’s background and qualifications associated with an applicant or a licensee. Information Practices Act of 1977 and other applicable state and federal laws. we may not be able to contact you or help resolve your issue. Officer, 1515 K Street, Sacramento, CA 95814, (866) 275-2677.